Using historical production data, we calculate that global nuclear power has prevented about 1.84 million air pollution-related deaths and 64 gigatonnes (Gt) CO2-equivalent greenhouse gas (GHG) emissions that would have resulted from fossil fuel burning. Based on global projection data that take into account the effects of Fukushima, we find that by mid-century, nuclear power could prevent an additional 420,000 to 7.04 million deaths and 80 to 240 GtCO2-eq emissions due to fossil fuels, depending on which fuel it replaces. 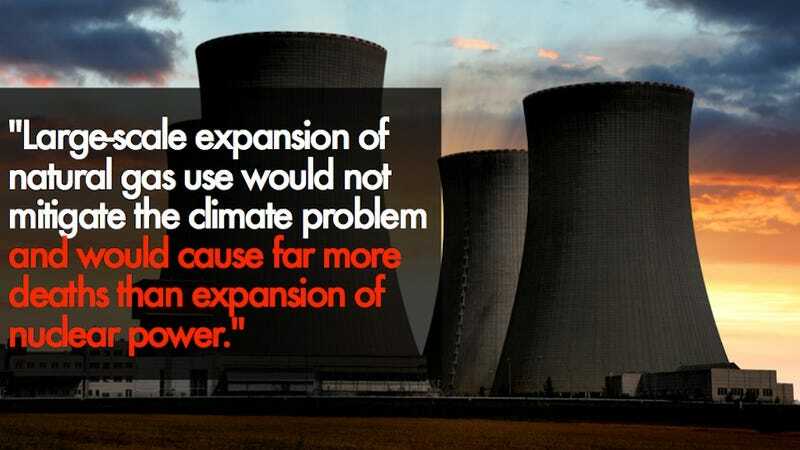 By contrast, we assess that large-scale expansion of natural gas use would not mitigate the climate problem and would cause far more deaths than expansion of nuclear power. NB: In the aftermath of Fukushima, the role of nuclear power on the stage of worldwide energy supply has become uncertain. Nuclear power has a knack for scaring people, albeit for reasons that are often unfounded. This is not to say nuclear doesn't have very real risks associated with it, but studies like this one underscore the importance of objective risk perception as we strive for safer, more environmentally conscious, and – perhaps most important of all – more comprehensive energy solutions. Nuclear is not the end-all be-all answer to our energy future. Neither are fossil fuels. They are, however, complementary options, and an ideal energy solution will likely see them both implemented, along with renewables. What is the worst kind of power plant disaster? Hint: It&apos;s not nuclear. For more on a multi-pronged approach to long-term energy solutions, we highly recommend checking out some of Maggie Koerth-Baker's writing on the subject. (She recently published a book about energy policy that offers one of the smartest takes I've encountered on the subject. It's also just a pleasure to read, which is saying something. Most stuff on energy policy I have to read standing up.) She's also blogged extensively on the subject of nuclear energy's risks and rewards at Boing Boing. Check it out. Visit Chemical & Engineering News for more coverage of Karecha and Hansen's findings.